QuadraLean, By RSP Nutrition, 150 Caps at SameDaySupplements.com® for lowest price. Quadralean is a 100% stimulant free weight loss solution scientifically formulated to target and control the 4 key factors of weight loss: Appetite, Fat Storage, Energy and Metabolism. Quadraleean contains effective dosages of 4 primary ingredients that control the 4 factors of weight loss. What's In Quadralean By RSP Nutrition? How Do I Take Quadralean By RSP Nutrition? Dosage: Take three capsules on an empty stomach twice daily. For best results, take 30-60 minutes before meals with the first serving before breakfast and the second serving before exercise. 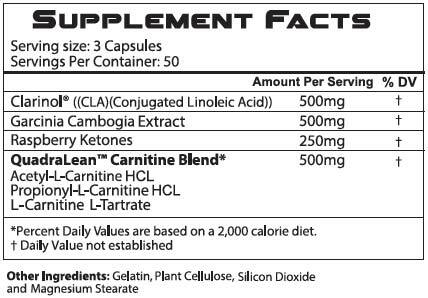 Do not exceed 6 capsules in a 24 hour period. To be used in conjunction with a reduced calorie diet and exercise program. We have a large selection of in-stock Rsp Nutrition products including CLA items and others for the lowest prices at SameDaySupplements.com® It's always easy to shop for QuadraLean, By RSP Nutrition, 150 Caps at SameDaySupplements.com because you can browse by reviews, brand, prices or search for specific ingredients using our search tool. In-stock orders placed before 3pm EST ship out the same day to USA, Brazil, United Kingdom, Canada, Germany, Australia, Japan, India, France and worldwide at the cheapest prices online.